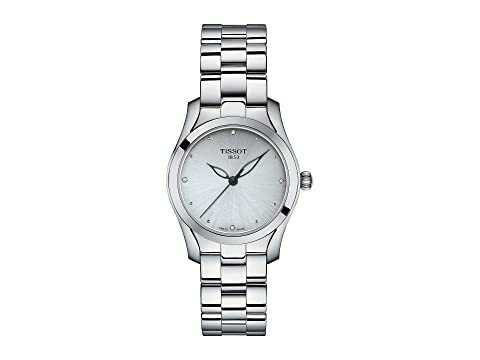 Compose a sparkling resume of stylish beauty with the Tissot® T-Wave watch. Round 316L stainless steel case. Deployment clasp closure with dual push-button release. Three-hand analog display with ETA F04.111 Swiss quartz movement. Grey dial face features four diamond indexes at 3, 6, 9, and 12 o'clock. Splash resistant 3 ATM/30 meters. We can't currently find any similar items for the T-Wave - T1122101103600 by Tissot. Sorry!